Does it sometimes feel as though you have a stone in your shoe, and when you check there isn’t anything there? Or maybe you get a burning/tingling pain on the bottom of your foot that radiates into the toes? It might be that you have a Morton’s neuroma. 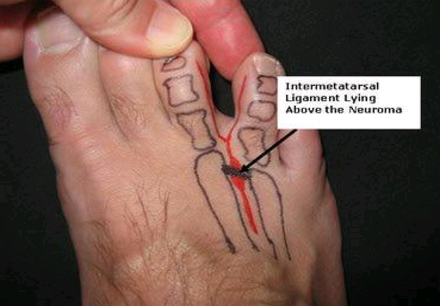 A Morton’s neuroma is not actually a neuroma. It is the fibrosis of an inter-digital nerve underneath the forefoot just before your toes. It’s usually felt between your third and fourth toes but can be felt in any of your digits. The pain has been described as sharp, throbbing, burning or feeling like you are walking on a stone or bunched-up socks. A Morton’s neuroma is usually caused by the pulling of the deep transverse ligaments between the plantar plates (see photo). This results in the ligament thickening which subsequently leads to agitation of the nerve. Sometimes a palpable fibrosis mass can be felt between the toes along with some swelling. Common causes for thickening of the ligament include tight-fitting or pointed shoes, high heels or the loss of shock-absorbing fat pads on the underneath of the foot. Other contributing factors maybe surrounding joint disease or biomechanical issues such as excessive pronation (flat feet). Most people complain of the pain usually after walking or running for a couple of hours in shoes. Relief is usually felt when you take the shoes off and massage the foot. Footwear is a key contributing factor to developing a Morton’s neuroma which goes to explain why this is a very common injury for women and it is something that we see and treat very often. The first and immediate priority is changing footwear. The new pair of shoes need to have a wide/deep toe box, a rounded not pointed end of the shoe and a stiff shank (that is rigid from heel to ball of foot). This will help assist with biomechanical issues as well. 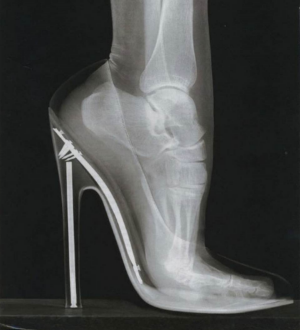 Critically, high heels should NOT be worn. To further reduce pressure in the forefoot, loosen the shoe laces at the front of the shoes. Injection of local anaesthetic by a podiatrist has proven to be a good diagnosing tool while also providing a temporary break in the pain cycle which can assist with the relaxation of the area. Gold-standard conservative podiatric treatment for a Morton’s neuroma are prescription-made orthotics that aim to correct any biomechanical issues which may be leading to increased traction of the deep transverse ligament. The orthotics will utilise surrounding muscles to strengthen your foot type in an attempt to prevent the pain from returning. It’s very important to not self-diagnose these issues, as there are a number of different diagnoses for this type of pain including plantar plate tears, joint arthropathies, capsulitis, bursitis or metatarsal stress fractures, with each requiring a different treatment. Make an appointment with a qualified podiatrist for the right advice and treatment so you can be pain-free.